Summary: Learn how to hang wallpaper, calculate how much wallpaper you will need, master the basic wallpapering techniques, wallpaper around a window, wallpaper around a door, wallpaper behind a radiator, wallpaper around a socket and switch, wallpaper around an external corner and paper around a ceiling light. Before you start wallpapering, you need to plan how you are going to approach the task. This will allow you to successfully negotiate the room in terms of windows, doors and corners. To calculate the number of rolls of wallpaper you will require, multiply the height of the walls by their length to get the surface area of the walls in your room. The length of one roll of wallpaper will be printed on its packaging which when multiplied by its width will give you the surface area of one roll. Divide the surface area of the walls by the surface area of one roll of paper to find the number of rolls you will need. But remember it is necessary to add an additional 10% - 15% to your total (rounding it up to the nearest roll) to compensate for trimming, cutting around windows and doors etc, and any mishaps that may occur. If you are using patterned wallpaper, which will involve matching the design, even more wastage will occur. If using patterned wallpaper, it is a good idea to start in a more discreet, less noticeable corner because when the pattern rejoins the starting strip after having gone a round the room, there is no guarantee the pattern will come together perfectly. To start with, using a spirit level draw a vertical line half a roll's width away from the starting corner. This will be the guide from which you will hang the first strip of wallpaper. Take the paper and roll it out on the pasting table. Measure the length you require, adding a little extra so you have a slight overlap at the top and bottom of the wall. Mix the wallpaper paste according to the manufacturer's instructions and using a pasting brush apply evenly over the paper, working from the centre out to the edges. Fold the paper in a concertina fashion. Address the top edge of the paper to the top of the wall overlapping it slightly onto the ceiling. Line up the side edge of the paper with the guideline on the wall and when satisfied the paper is level, unfold the paper. With a paperhanger's brush smooth the paper in position, working from the centre to the edges while checking the paper is still in line with the guideline. Once you have the pasted the first piece of paper to the wall, with a pencil mark a line on the paper where wall meets the ceiling and skirting board. 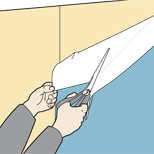 Using a sharp craft knife or wallpaper scissors, neatly trim the excess from the top and bottom of the wall. Then using a clean damp sponge, wipe away excess paste from the wallpaper. If using patterned paper, when hanging the next length of paper ensure the pattern matches at eye level. This keeps any pattern-drop at a high or low level. When the edges of the two lengths of paper are joined, you should clean the join with a wet sponge. Finish off by gently running a seam roller up and down the seam. Continue papering around the room in a clockwise direction. Use a brush to smooth the paper whilst checking it against the vertical guide. 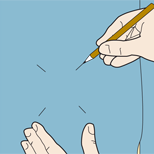 Trim the top and bottom of the paper along your pencil lines. Use a seam roller along the joins for a neat finish. When you reach a window, hang the paper so that it overlaps the recess. 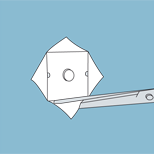 Use wallpaper scissors to make a neat horizontal cut in line with the top edge of the recess. Then make a second cut in line with the top edge of the windowsill. Brush the flap into position so it is smooth. 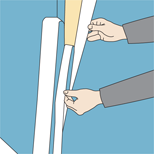 If the paper doesn't reach to the window frame, it will be necessary to cut a short piece of paper a little wider than the gap and paste it in position. If using patterned paper ensure the pattern matches. Mark a defined line where the paper meets the window frame, then peel back the paper and trim the excess. To paper the top of a window recess, cut a piece of paper that will reach from the top of the wall to the window frame adding 50mm (2in) for trimming. Once again if using patterned wallpaper ensure the pattern matches. Hang this piece of paper from the top of the wall creating a seam with the previous sheet and brush into the recess. Trim where the paper meets the ceiling and window frame. Repeat this process until you again require a full-length of paper. To paper under the windowsill, measure from the top of the skirting board to the underside of the sill, adding 50mm (2in) for trimming. Cut the paper to match the pattern if necessary, paste and trim. Repeat until you need a full length of paper. 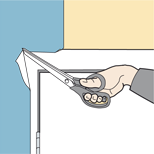 Use wallpaper scissors to make a neat horizontal cut in line with the top edge of the recess and another in line with the top edge of the windowsill. After smooting the paper into position, trim the paper where it meets the window frame. When you come to a door, the technique is simple. 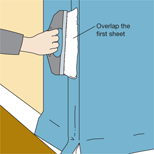 Start off by hanging the sheet of paper as normal, brushing it up to the doorframe. 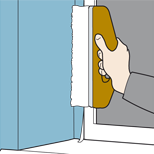 Where the paper overlaps the door, lift the paper away from the wall and cut a diagonal slit in the excess paper up towards the top corner of the doorframe. This will allow you to fit the paper around the top of the doorframe. Then brush the paper back into place leaving the excess around the frame. Using a craft knife, trim the excess neatly, using the edge of the doorframe as the guide. With the brush smooth the paper around the frame. For the top-middle of the doorframe, the technique is similar except there are no corners to contend with. Start as usual by hanging a short length of paper above the door. Then just brush the paper into place and trim the edge where it overlaps the top of the doorframe. When you reach the other side of the door, paper in exactly the same way as the first side, except do not trim along the vertical edge of the doorframe until you have pasted on the next length of paper. This is to ensure the edge of the paper remains vertical as you proceed around the rest of the room. One you have hung the next complete length of paper, return the excess paper overlapping the architrave and trim with a craft knife. Cut a diagonal slit in the excess paper up towards the top corner of the doorframe. Radiators can be removed (see replacing a radiator), but you can also paper behind them while they are in place. Paste and hang the paper to about 25mm (1in) above the radiator, leaving the excess to hang over the radiator. 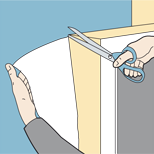 Use scissors to cut the paper at least 50mm (2in) below the top of the radiator. Carefully smooth the paper behind the radiator with a radiator roller. Cut the paper at least 50mm below the top of the radiator. Turn off the power to the light switch or socket you are papering around at the consumer unit or fuse box. Paste and hang the paper over the socket or switch plate, marking the corners of the socket or switch plate onto the paper. 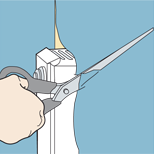 Use a craft knife to cut along these lines and bending the paper back from the edges of the socket, cut off the excess. Loosen the screws on the socket or switch to push the trimmed edges underneath the socket. Smooth the paper around the socket or switch plate. Screw the socket or switch plate back into place and wipe away any paste. Mark the corners of the socket plate on the paper. After bending the paper back from the edges of the socket, cut off the excess with scissors. One of the more common difficulties can be external corners. The best approach is to firstly hang a length of paper so it bends round the corner of the wall. Then cut a slit at the bottom on the corner forming two separate flaps, and brush the paper flat. Then hang a second sheet so there is an overlap going round the corner. Make sure the paper is vertical and the patterns match correctly, and then brush this second sheet flat. Using a long straight edged rule and a craft knife cut a vertical line through both layers of the overlap close to the corner. This way you can remove the excess paper below the top sheet, and the excess top sheet overlap that folded round the corner. This should leave a perfect joint between the two sheets. Trim the paper from the bottom and top of the sheets in the normal way, whilst removing paste from the surface and rolling down the joins using a seam roller. Then you are ready to hang the next sheet. Hang a second sheet so there is an overlap around the corner and brush flat. After cutting through both layers of the overlap close to the corner, you can remove the excess paper below the top sheet, and the excess top sheet overlap that folded around the corner leaving a neat join. Before papering around a ceiling light turn off the electricity. Remove the light bulb and all fittings so only the cable is hanging from the ceiling. Hang the paper until you reach the cable and then make a small hole in the paper at the point where the cable joins the ceiling. 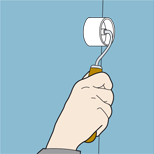 Carefully feed the cable through the hole and continue to smooth the paper into position until you reach the wall opposite wall. Screw the fittings back in place. You will need to make small holes in the paper to fit the light base to the ceiling. 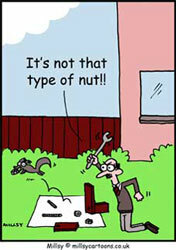 Do not switch on the electricity until the paste is dry.